Two New Mexico high schools are seeing multiple benefits from newly-installed solar power systems, with both cost savings and an education bonus in having the solar power systems as a teaching tool, perhaps for the solar leaders of tomorrow. This year, students at the Cleveland and Rio Rancho high schools in Rio Rancho, New Mexico, are learning firsthand the benefits of solar power. Their education isn't coming from books, but rather from two solar power installations recently constructed on their campuses. The two high school solar sites are each seven to eight acres and produce 2.36 MW, 1.2 MW of which is installed on solar trackers. The electrical output from both sites is enough to power roughly 80 percent of each school's required electricity needs and offsets approximately 1,136 tons of greenhouse gas emissions—the equivalent of taking 632 passenger cars off the road. Rio Rancho, located just north of Albuquerque, is the third-largest (and one of the fastest growing) cities in New Mexico. At a time when school districts are struggling for funding, the solar sites at the Rio Rancho schools came at no cost. Michael Fahey, the commercial program manager for Washington Gas Energy Systems, collaborated with AMSOLAR and Conergy Projects Inc. to fund and develop the arrays. Washington Gas Energy Systems currently owns and operates the systems under a 20-year PPA. Not only was there no cost for the solar projects, there are, in fact, savings. "The anticipated expenditure savings should be roughly about $200,000 a year," said Al Sena, executive director of facilities for Rio Rancho Public Schools. "The savings provided to the district will allow the use of funds for other items that would not be otherwise available and make these projects fiscally responsible." Before the solar projects could become an educational boon, they required a lot of prep work and planning. Steve Crivelli, director of project management, Conergy Projects Inc., says that developer AMSOLAR brought in Conergy and its construction team in the fall of 2012. One of the big challenges they faced right off was the grading issue. 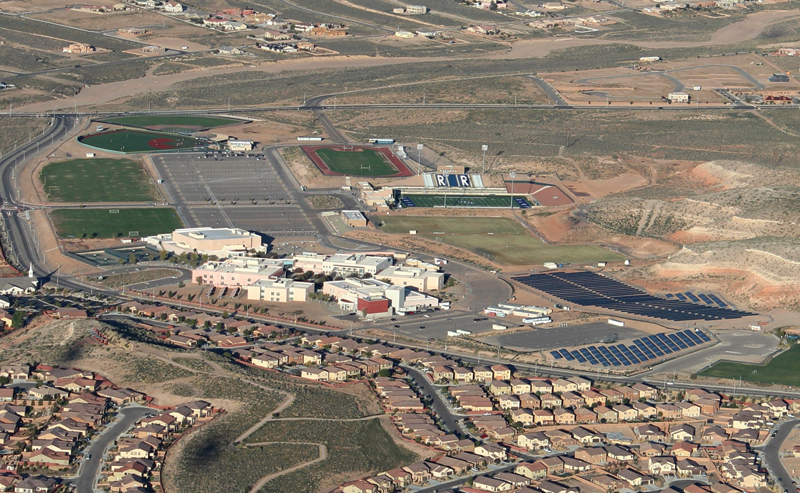 "The Rio Rancho High School project site had to be completely re-graded. It was a very rolling site, and with a single axis tracker, we had to go through and create more of a consistent slope so that the tracker would properly function and operate," says Crivelli. Cleveland High School also had grading issues, but they weren't as severe. "We still had to go through and create a new pad, and the site had a geothermal well that we had to deal with as well." Edgar Pedregó, project manager for Array Technologies, which is headquartered in Albuquerque, New Mexico, says his company was involved in meetings early on to provide assistance on how the trackers could be laid out to accommodate the topography. "Once we got the order, we designed the system for them, and we built up our bill of materials and shipped the product. After that, we still had a lot of contact onsite, especially since we were local. Even if we weren't local, we typically go out to our project sites and provide guidance." It wasn't just the grading that was an issue. Before construction was underway, the school district decided to re-evaluate a different area for the site. Location is vital to a school, especially one that is looking ahead to future growth. Storm water management had to be worked out as well. "We had to take into account not only storm water management for the site and the area that we were impacting with the array, but also the surrounding area," says Crivelli. To make sure that construction interfered as little as possible with the students and their studies, work began a couple weeks before students were let out for the summer and wrapped up shortly after they returned. Finally, by April 2013, permitting and plans were in place and ground was broken. Choosing the solar equipment was a collaborative effort by Conergy and the developer on the project, AMSOLAR. They used Advanced Energy (AE) inverters and 4,000 DMEGC solar modules. The fixed tilt racking was provided by Mounting Systems Inc., and the DuraTrack HZ single-axis trackers were provided by Array Technologies. Pedregó says this isn't the first time their trackers have been used at schools. In fact, you may have seen them installed on some college campuses. In this case, the tracker was well suited to work with the unique grading issues. "Because we had slopes in north-south and east-west directions, it made this project different," says Pedregó. "If you can imagine a long road that goes north to south, panels are mounted on the structure that's aligned north to south. And then from east to west they're all linked together using drivelines, which interact with the gear that spins each row of modules into place. "Our system's design allows us the flexibility of putting an angle in those drivelines, and we can connect many rows at a large range of angles. From one row to the other, the angled connections can go up to about 40 degrees. I don't think there's anybody else that can do that in the market." Pedregó says people are sometimes concerned that maintenance is going to be higher with a tracking system, but it shouldn't dissuade them. "Yes, maintenance is a little bit higher because you've got working, moving components, but it's very minimal. It involves checking a few bolts and basically greasing a couple parts." The upfront cost is also a little higher with a tracking system, but Pedregó says the investment is worth it. "You end up getting proportionately more energy versus the additional cost." Conergy was able to hire many local contractors during construction, doing work from engineering to grading. "The electrical subcontractor was a local contractor, and the contractor who installed all the racking and solar modules was out of the Bay Area. We also used local labor to help do the installations. In fact, there was only one non-local subcontractor on the entire project," says Crivelli. One construction challenge you don't see often is how to deal with a high school cross-country track. "We interrupted their track and had to work with the district to buy them an adequate re-route," says Crivelli. "We worked it out so that the array was split into two sections so runners would have access through the middle of the array and then up and around a portion of the array. In short, we had to relocate some of the array so they had good access for the track." 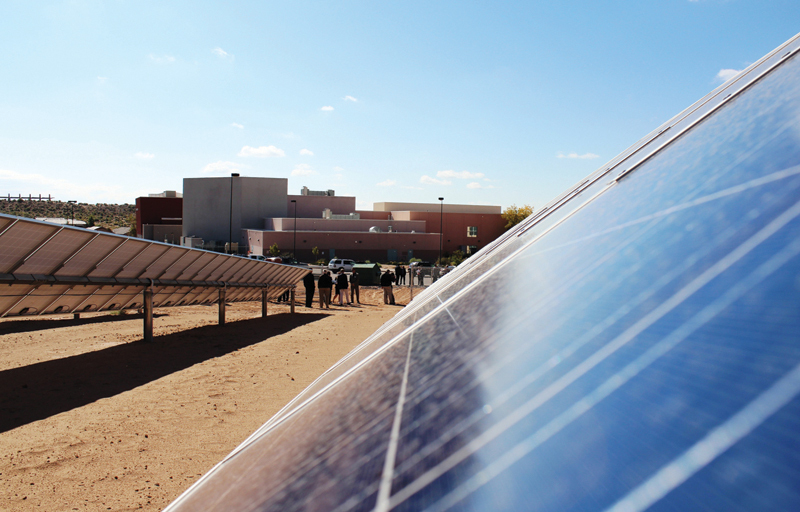 The Rio Rancho School District is pleased with the end result of the solar projects. The solar installations in the backyards of their schools are not only saving the district money, they are also incredible teaching tools that ensure current and future students will learn about solar energy and environmental sustainability. "Our goal was to be done by September 30, and by the time they came back, we were pretty much done with all the heavy lifting," says Crivelli. "All the site improvements were done, and it was just a matter of working inside the solar field and doing some final connections." The solar facilities came in on time and on budget and began producing energy in mid-November. To date, they have been working perfectly. "We're on target for what we committed to generate," says Crivelli. For the O&M period, Conergy will be monitoring the systems on a daily basis. After that point, the asset manager will take over the duties. Conergy has also had experience constructing solar facilities on school campuses, and they know the solar can do much more than just provide power. "It's pretty standard at the beginning of these projects that the district wants to use it for educational purposes, so we try to set it up so they have the ability to do that," explains Crivelli. "They like to be able to see the monitoring—how much energy is being produced from the system. So we always give them a portal to be able to see that. We usually install monitors in the lobbies of each school so they are able to see the production, among other things." For schools that are considering a solar array, Crivelli's advice is: "Plan and continue to plan. Plan early and plan often." "It's important to plan early with your development team and understand the magnitude of the project and how it's going to impact the school," he adds. "It's really like any normal improvement project to a school. We've got to shut down the school for power to make the connections, and we've got to change traffic lanes and re-route students' normal path of travel. It's a normal construction site." 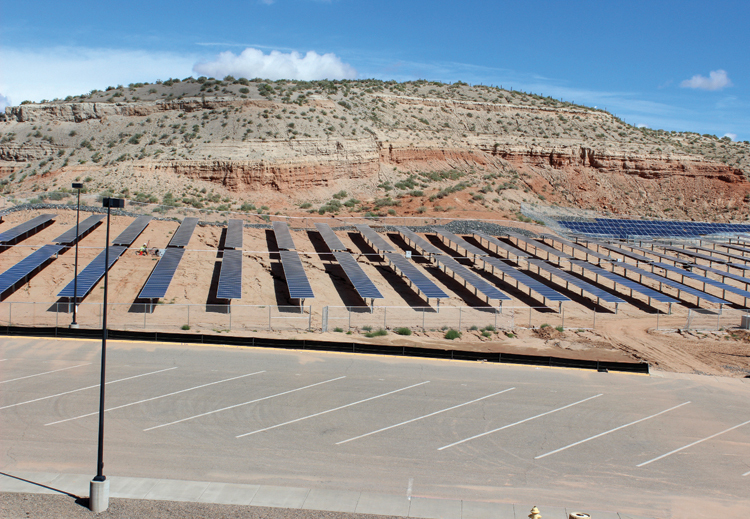 In the case of these two New Mexico high schools, Crivelli credits much of the success of the solar power projects to teamwork. "It was a pleasure working with the local school district and electrical contractor, Mosher Enterprises; they both offered a tremendous amount of help throughout the entire permitting and construction phase of the projects." Conergy brought plenty of experience to the project. The company has more than 15 years and 580 megawatts of experience in planning, construction, and operations. The school district is pleased with the end result. The solar installations in the backyards of their schools are not only saving the district money, they are also incredible teaching tools that ensure current and future students will learn about solar energy and environmental sustainability. Those students could very well be the solar leaders of tomorrow.